RCM Elevators proudly installs high-quality, long lasting home elevators from the best manufacturers from across the country. Inclinator handcrafts each elevator and has several different cab models. They offer the most choices and custom features in the industry. Specializes in the manufacturing of quality standard and custom designed winding drum and roped hydraulic elevators for use exclusively in private residences. 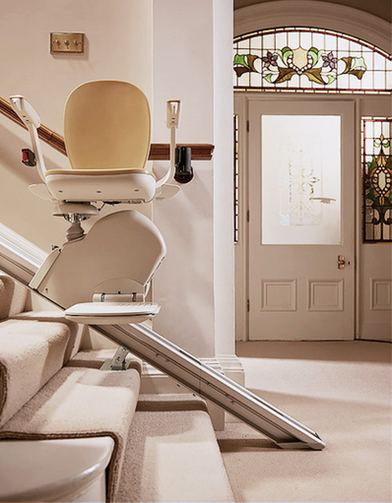 As North America’s leading manufacturer of stair lifts, Bruno Independent Living Aids is proud to offer a complete line of the finest battery-powered stairway lifts for residential and commercial use. Newly Redesigned for 2009! Bruno’s Electra-Ride III Curved Rail model offers a safe and durable design that installs on virtually all curved stairways! Savaria Concord is proud to offer home accessibility equipment that responds to your everyday needs and enhances your quality of life. We pride ourselves on delivering reliable accessibility products for more than 30 years. Savaria Concord develops, manufactures and distributes innovative top-of-the-line accessibility products. We guarantee our labor for one year from completion. RCM’s factory trained technicians make your installation smooth and worry free. The P.A.L. Vertical Platform Lift can be installed indoors or outdoors and will provide many years of reliable service with its high tech construction and electrostatically applied baked-on polyester gloss powder coat paint. The Multilift vertical wheel chair lift offers safe and reliable operation for its users. This ruggedly constructed lift has been proven for both indoor and outdoor applications. Sign Up to be Updated About Our New Products and Special Deals!